Chiclayo ([tʃiˈklaʝo]) is the principal city of the Lambayeque region in northern Peru. It is located 13 kilometers inland from the Pacific coast and 770 kilometers from the nation's capital, Lima. Chiclayo is Peru's fourth-largest city, after Lima, Arequipa, and Trujillo, with a population of 738,000 as of 2011. The Lambayeque region is the fourth most populous metropolitan area of Peru, with a population of 972,713 in 2009. The city was founded near an important prehistoric archaeological site, the Northern Wari ruins, which constitute the remains of a city from the 7th- to 12th-century Wari Empire. Many different historical accounts tell of the naming of Chiclayo. Some attribute it to an indigenous man known as "chiclayoc" or "chiclayep" who transported plaster between the ancient cities of Zaña, Lambayeque and Morrope. Another version claims that around the time that the city was founded, the area was home to a green-colored fruit called chiclayep or chiclayop, which in the Mochican language means "green that hangs". In some towns in the highlands of Cajamarca, squashes are known as chiclayos, evidence that this fruit is the origin of the city's name. Another source indicates that the word is a translation from the extinct Moche language and is derived from the word Cheqta which means "half" and yoc which means "property of". Others say the Mochican language had words similar to the name, such as Chiclayap or Chekliayok, which means "place where there are green branches". The coat of arms summarizes important features of the province, such as the one dedicated to the Virgin of the Immaculate Conception, represented in light blue background, which is a Catholic town, represented on the cross, but, also see other items related to the history, geography and landscape. 'Tumi' the tumi is a ceremonial knife used by the Lambayeque culture, represents Naylamp. 'Sea' the sea was always very important for its marine resources and legends that are told of it. 'Huerequeque' is the typical bird of the region, is so called because in his song seems to say Huere-que-que-que. During the Peruvian War of Independence, Chiclayo supported General José de San Martín's liberating army with soldiers, weapons, horses, and other resources, under the supervision of the most progressive creole, José Leonardo Ortiz. On 15 April 1835, Chiclayo was proclaimed a city by then-president Felipe Santiago Salaverry, who declared it a "Heroic City" in recognition of the services its people rendered in the War of Independence. The next day, the Chiclayo Province was organized, with Chiclayo designated as its capital. Chiclayo is also known as the "City of Friendship" and Perla del Norte ("Pearl of the North") of Perú. In Chiclayo, the mayor is the head of government. The mayor is democratically elected for a period of four years. Each district also has a mayor, under the supervision of the mayor of Chiclayo. They are responsible for coordinating government administrative action in their district. Central Chiclayo comprises three districts: Chiclayo, José Leonardo Ortiz, and La Victoria. Three other districts (Pimentel, Pomalca, and Reque) are peripheral to the central city. Districts are subdivided into housing developments. The total land mass is 252.39 km2. Adding Pimentel, Pomalca, and Reque to the City of Chiclayo was proposed by an urban development plan (1992) called "Chiclayo 2020". This plan was superseded by PAT-PDUA. Reque and Pimentel are in the process of merging completely. The metropolitan area comprises central Chiclayo and adjacent areas, including the provincial capital of Lambayeque, some of which serve as bedroom communities and supply goods to Chiclayo. 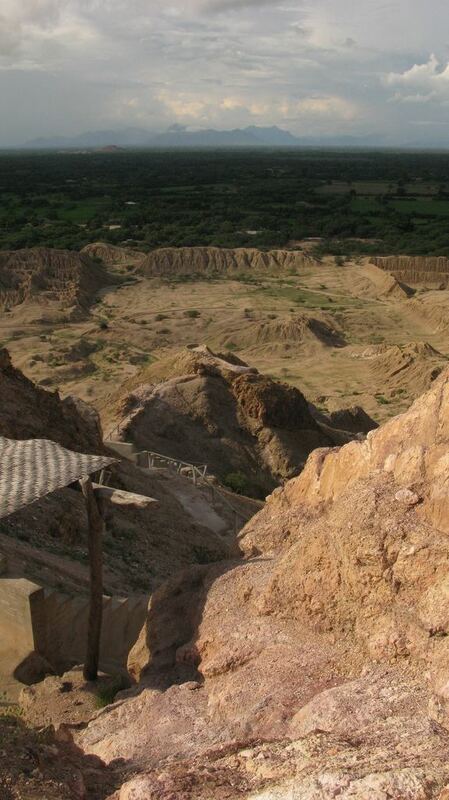 Chiclayo has a warm and very dry desert climate with the sun shining all year around. Since the city of Chiclayo is located in a tropical zone near the Equator, the weather should be hot, humid, and rainy. However, it mostly resembles a subtropical climate, being comfortable and dry. This is due to the strong winds called "cyclones" that lower temperature to a moderate climate for most of the year except in the summer months where the temperature rises, so summer is often spent in resorts like Puerto Eten and Pimentel. Periodically, every 7 to 15 years, there are hotter temperatures with much higher rainfall and extreme rise of river water. Cap. FAP José A. Quiñones Gonzales International Airport (IATA: CIX, ICAO: SPHI) is the main airport serving Chiclayo and the surrounding metropolitan area. It is run by ADP, a private airport operator that operates various airports in northern Peru. The airport hosts domestic airlines, international airlines flights, and fuel supply services. The terminal has a runway of 2520 by 45 meters. Four airlines serve Chiclayo's international airport; Latam Airlines, LC Peru and Viva Air Peru offering domestic service to Lima. On July 2016, Copa Airlines began direct flights between Chiclayo and its hub in Panama, making it the first ever international flight to arrive to the city. US-based Spirit Airlines has expressed interest in serving Chiclayo from its hub in Fort Lauderdale, Florida, United States. To adequately accommodate the transportation demand, the city is served by two different land terminals, one located towards the southern end of the city and another at the northern end on the Panamerican Highway. A substantial number of bus companies have their own terminals, many of them located near the downtown of the city and in nearby areas. These interprovincial buses contribute to the congestion experienced in downtown Chiclayo. To try to solve the problem the city government has proposed a plan to build a central station in the city. Regionally, there are various different public services such as combis, cousters, colectivos, which provide services within the districts and provinces of the department of Lambayeque. There are also an overwhelming number of private taxis which incessantly honk their horns throughout the downtown area of the city, causing a great deal of unwanted noise pollution. According to the Census of Population and Housing undertaken in 2007, 574,408 people inhabit the area within Chiclayo's city limits or the six municipalities. The metropolitan area has a population of 930,824; it includes other nearby cities like Monsefú and Lambayeque in a ten-minute radius by paved highway. Under the thirty-minute range are, in order of hierarchy, Ferreñafe, Santa Rosa, Eten, Illimo and Tuman. Chiclayo is at the center of the Chancay River delta, in a fertile valley. 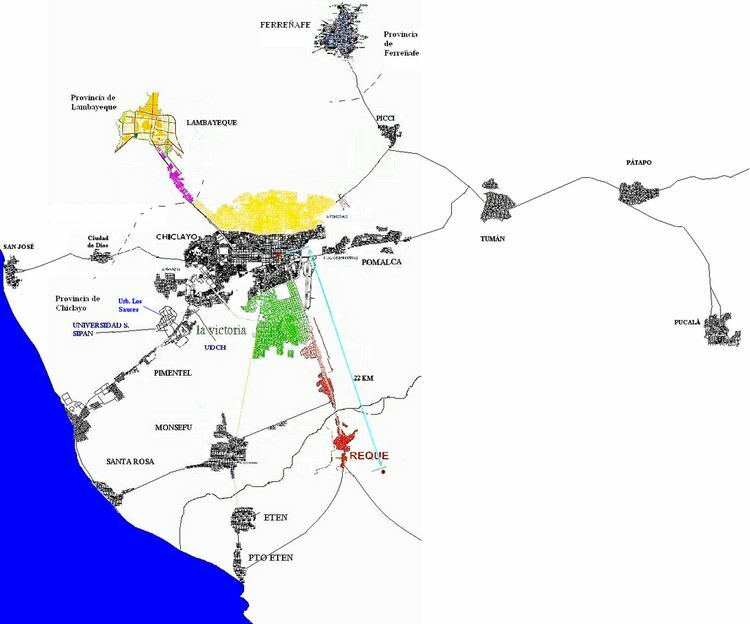 According to the planning director of Chiclayo, by 2020 the San Jose district belonging to the Lambayeque Province will be completely integrated with the city of Chiclayo. The district has a population 12,156 inhabitants. Most of the district is conurbanized with the rest of Chiclayo. 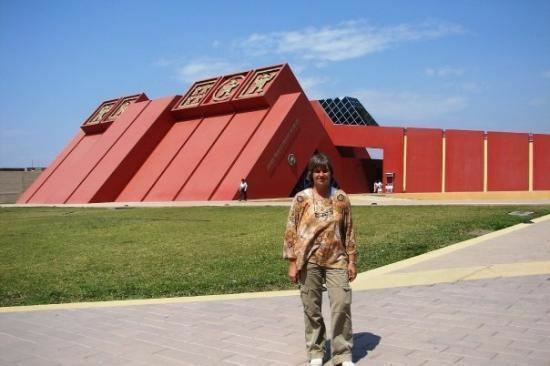 note: Pedro Ruiz Gallo National University is not in Chiclayo but in near Lambayeque city, 11 km distance. 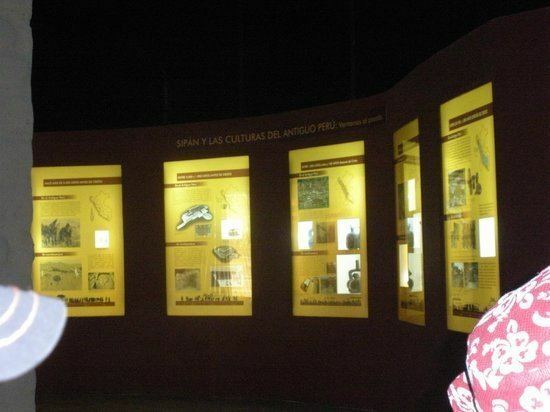 On Site Museum in Sipán is the newest and the smallest museum. He was born on 22 April 1914 in the District of Pimentel on the coast of the province of Chiclayo, studied his primary education at the National College San Jose City Chiclayo and then transferred to Lima and continued his secondary education at the Colegio sacred Hearts Recoleta and concluded at the National College of Our Lady of Guadalupe, then went on to serve in Peru as Air Force pilot and native of duty in the conflict against Ecuador in 1941 blew up one days after 23 July being hit by artillery Ecuador did not jump the plane by parachute to save his life but took him to crash into the enemy target. Augusto Bernardino Legui'a Salcedo (Lambayeque, 19 February 1863 - Callao, 6 February 1932) was a Peruvian politician who was President of Peru Constitutional for four periods: 1908–1912, 1919–1925 (with a transitional period prior), 1925–1929, and 1929–1930. In the last three periods, totaling eleventh consecutive year, they are known collectively as the Oncenio. Altogether ruled 15 years, being the most time Peruvian president has ruled. Óscar Luis Castañeda Lossio (Chiclayo, 21 June 1945) is a Peruvian lawyer and politician, founder and president of the National Solidarity Party. Ran for presidency in the general election of 2000 Peru and Peru's general elections of 2011, ranking fifth in both occasions. He was Mayor of Lima January 2003 to October 2010, when resignation to run for a second time to the Presidency of the Republic. Expanded the North Avenue Balta and rebuilt in particular the lateral part of the municipality, respecting the original design. Built the Civic Center in Chiclayo, the Municipal Library building and then allowing the construction of the Post Office, National Bank that now houses the Public Ministry and the Palace of Justice . He started channeling the Acequia Cois then started building Leguia Avenue .Opened Avenue South Balta from Bolognesi and rebuilt Salaverry Avenue . He always fought for the Olmos Irrigation Project that is a reality today. Yehuda Simon Munaro (* Lima, 18 July 1947 -) is a veterinarian, Peruvian sociologist and politician. The 10 October 2008 was appointed prime minister of Peru, replacing Jorge del Castillo, 1 remained in office until 11 July 2009. Magaly del Rocio Rivasplata Viviana Aita (born in Lambayeque, 4 October 1977) is an American model, beauty queen and Peruvian businesswoman. She was elected Miss Peru in 2001. Angel Javier Velásquez, (* Eten, Lambayeque, Peru, 12 March 1960) is a lawyer, constitutionalist and Peruvian politician. APRA member since college, representing the constituency of Lambayeque in the Congress of the Republic of Peru since 1995. It was the Prime Minister of Peru from 11 July 2009 until 13 September 2010.